Tracing musical continuity in a music series is often a challenge, because of changes in personnel, location and assumptions. All the more reason therefore in 2017/18 to celebrate the 25th anniversary season of classical concerts presented by the Nine Sparrows Arts Foundation (NSAF) and its artistic director, Toronto composer, conductor and organist Eric Robertson. Now named Lunchtime Chamber Music, the series currently takes place at Yorkminster Park Baptist Church (on Yonge St. north of St. Clair Ave.). Sometimes performers are advanced students, through formal linkages with the University of Toronto Faculty of Music and the Royal Conservatory Glenn Gould School; at other times they are musicians from Toronto and elsewhere, reaching out to new audiences. The admission-free, donations-welcome concerts take place Tuesdays between 12:10 and 1pm, September to June. A personal note: I first learned of these events from a longtime attendee, my mother. Mary Knox’s own musical involvement began in the late 1930s accompanying the North Toronto Collegiate choir, where for three years, young composer Godfrey Ridout came in as musical director for Gilbert and Sullivan operettas. Rehearsal duties were shared by Mary and singer/arranger/pianist Denny Vaughan, who later flourished during the early days of television in England and Hollywood. My mother’s younger sister Alice was a violinist who once played with North Toronto Collegiate fellow student, composer and pianist Harry Somers. A decade ago mom conveyed to me her enthusiasm about a series of organ recitals at St. Paul’s Anglican Church on Bloor St., coordinated by organist-choirmaster Eric Robertson. In 2009 when Eric and the NSAF came to Christ Church Deer Park, they organized Lunchtime Chamber Music (and I promptly joined the church choir). Eric and NSAF moved to Yorkminster Park in 2014 where they present these chamber music recitals under the auspices of the Nine Sparrows Arts Foundation and Yorkminster’s Open Doors Ministry. That this latest move was right across the street was no accident. North of Bloor St., a transition begins between Toronto’s concert-rich downtown and a more understated classical “musical ecology.” Classical music lovers sometimes overlook church concerts. Yorkminster Park is one of a number of “churches on the hill” in the area; Calvin Presbyterian is a popular venue for presenters and ensembles. Christ Church Deer Park, and further west, Grace Church on-the-Hill and Timothy Eaton United, collaborate regularly on choral concerts, present series of their own, and make their premises available. Seniors, local residents, and others further afield attend the Lunchtime Chamber Music series at Yorkminster Park. Many older people find the noon-hour neighbourhood option more attractive than night time downtown. Key to the series’ ongoing appeal is its diversity. Among performers and programs I have heard in past seasons have been: violinist Sonia Sokolay, a master’s student at New England Conservatory, who has appeared several times and is planning to bring her string quartet from Boston to play; The Hogtown Brass whose concert appearance was followed soon after by a CD reviewed in The WholeNote; and flutist Alan Pulker, The WholeNote’s founding publisher, in intriguing unaccompanied works by C.P.E. Bach and Telemann. Robertson adds, “It’s important to mix young performers with older audiences; that was one of the reasons for starting the series, so that their musical education is not all divided up according to age group.” As an audience member at the series, I personally relish the easygoing conversation after the music has ended. Audience members have stories and experiences to share with the young musicians and new contacts are made. All over the city it is the presence of education, performances, connections in the community and links over the generations that provide the continuity and momentum that eventually make the outstanding performances and recordings highlighted in The WholeNote possible. The WholeNote is having a 20th anniversary concert and party for their readers and supporters on Friday September 25. And last spring I was asked by publisher David Perlman if I would co-host the grand occasion with him. Practically everyone in town knows TSP at 427 Bloor St. W. (or Trinity-St. Paul’s United Church and Centre for Faith, Justice and the Arts to give it its full name). 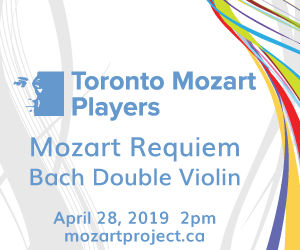 It is the home stage of the internationally known baroque orchestra, Tafelmusik and of the stellar early music ensemble, Toronto Consort. The building is also home to a vibrant United Church Congregation with a strong community history since 1875 and impressive social justice bona fides. The 120-strong Viva! Youth Singers rehearse and present their concert season there. Over the past few months I have looked at several local venues presenting concerts listed in The WholeNote. These spaces range from the venerable Music Gallery, whose motto “Toronto’s centre for creative music” has taken it into its 38th season, to the Aga Khan Museum’s world music-rich concert series, now in its fourth month. Their stories encompass their venue’s architecture and the public geographies they inhabit and serve. For example, the Music Gallery’s office and primary downtown venue, a block north of Queen Street West, is the modestly sized St. George the Martyr Anglican Church, its Gothic revival bell tower dating to 1844. The church site looks onto Grange Park and the 105-year old University Settlement social service centre. At the other end of the park sits the near 200-year-old former grand brick home called The Grange and its heir, the AGO. When viewed in the context of its historic urban geography, it strikes me that even though much of its music programming inhabits the experimental edge, the Music Gallery’s site echoes with distinctively old-Toronto tones. Most instrumentalists such as horn players, guitarists, bassists and drummers, have the advantage of being able to play their own instrument while performing live or recording in a studio. Pianists however, have a disadvantage in this area. They have to rely on the piano provided by the venue or the studio. Because of this limitation, it is very important to seek out the best piano when I am ready to produce a CD. Having recorded nine CDs with my trio, Steve Koven Trio, I know that Inception Sound Studio in Toronto has one of the finest pianos in the country. This piano transmits beautiful tones and has amazing responsiveness in its action. It also has a unique history. This specific piano was the first piano used at the legendary Imperial Room at Toronto’s Royal York Hotel. It is a 1929 New York Steinway D model and has been played by many of the great pianists that performed in Toronto from 1929 to the present day, Count Basie, Duke Ellington, Little Richard, Allan Singleton-Wood, John Arpin, Doug Riley and Don Thompson, to name a few who have played and recorded on this magnificent instrument. I recorded my last six CDs with my trio at Inception Sound on this very piano. So it seemed fitting to me, for my first solo piano recording, to revisit the instrument that has been my first choice for more than a decade. I returned to Inception Sound to record the CD, and Solo Retrospective was born. The concept behind the CD was to revisit previous compositions that reflect back 32 years. I chose a collection of original songs that represent both meaningful and significant times in my life. For example, the final track, Lifetime, was composed when I was just 18 – a song about first love. The opening track, Mist-ic, is a new composition which was inspired by a visit to Grand Manan Island in New Brunswick. While there, I spent an evening at a magical, “mist-ical,” fog-covered, remote beach at dusk. There was my song. The inspiration for another track, Artists, came to me while working on my Masters Degree at York University, surrrounded by boundless, youthful creativity; there was another song. 5 O’Clock Omelette is a new composition which pays homage to a musical exercise I learned in my undergrad program while studying Contemporary Improvisation at York in the 1980s. There will be a CD launch concert for Solo Retrospective at Musideum, 401 Richmond St. W., October 19 at 8pm. I am sitting in a beautiful, sunlit space with a sloping wooden ceiling, ready to experience the first of six AMAZING cello concerts. I know, I know ... I’m a bass player for God’s sake and not only am I looking forward to this concert but, together with TSO cellist Winona Zelenka I organized the whole series. How did this happen? Start with a stunning acoustic, and a gorgeous building in a part of town where you might not expect to hear classical music. I first discovered Seicho-No-Ie through a friend. I’m a bassist in the Toronto Symphony Orchestra and have been organizing concerts for as long as I can remember. In my experience, when musicians see a place like this they immediately think concerts! After our first visit to Seicho-No-Ie (a Japanese non-denominational centre of worship) my wife Kim and I invited Etsuko Kimura (assistant concertmaster at the TSO) to try her violin in this venue. Up until this point there had never been a concert in the building, a fact that we found rather exciting. Etsuko fell in love with the sound and, on the spot, we came up with the idea for a six-concert series with six violinists, six one-hour concerts and each one featuring one of J.S. Bach’s solo sonatas or partitas. Presto! It happened. That was last year. The series was a success; we were able to raise money for the church, pay the artists and bring fine music to the neighbourhood. So how do you follow that? Well, Bach did compose six suites for solo cello, too. TSO assistant principal cellist Winona Zelenka had attended one of the violin concerts (TSO concertmaster Jonathan Crow) and was blown away by the sound. When I mentioned a cello series she jumped at the chance and together we have assembled a lineup of six of the finest cellists you will find anywhere. Our country is well represented with players coming from Toronto, Vancouver and Montreal. Everyone loves the cello - this is a chance to get up close and personal with six terrific players, hear varied repertoire including all the Bach suites and explore a new concert space ... What more could you ask for? So join me October 26, as I sit back and enjoy the fruits of our labours.